It’s not every day that a passion project is pursued by a group of high school students and led by their high school teacher. 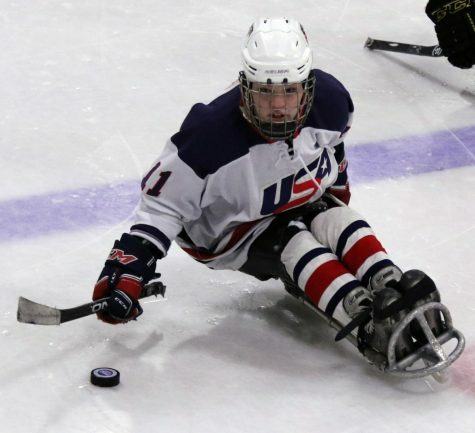 Such was the case earlier this year when 34 high school students — all hailing from five different high schools in Missouri — took on a project to create a website for the U.S. Women’s Sled Hockey Team. Students from Quill and Scroll schools Richland R-1, Francis Howell North, Francis Howell Central, Clayton High School and Kirkwood High School dedicated their time, expertise, and interest to a small, Paralympics-bound team of disabled women hockey players. In one weekend, these 34 students created an in-depth website for the USA Women’s Sled Hockey Team and, in doing so, formed a unique and unlikely bond among one another and also the team’s players. The project was piloted by Kyle Carter, the business teacher at Richland R-1 School in Essex, Missouri. Richland R-1 first became acquainted with Christina Gardner, a forward for the sled hockey team, on a trip to Washington, D.C.
“Richland was named a Blue Ribbon School by the Department of Education, and in November of 2016, we had a group of students, along with some of our administrators, that went to Washington D.C. and received the plaque and some other small awards— a ribbon, a banner, that kind of stuff. While they were there, they went to Arlington Cemetery. While they were leaving Arlington, they were getting on a shuttle to leave and one of them looks back and notices this veteran. She was struggling, and I think she was in her wheelchair in the very back of the line and she was having a tough time,” Carter said. Richland’s superintendent, retired U.S. Army soldier Frank Killian, went back to Gardner, also a veteran, and allowed her to go to the front of the line. From there, the relationship between this Missouri high school and the U.S. Women’s Sled Hockey Team spawned. In need of a speaker for Veteran’s Day, Richland administration contacted Gardner to come visit from Maine. Along with her, Gardner brought her service dog, Moxie, who also doubles as the U.S. Women’s Sled Hockey Team mascot. “[Gardner] came and spoke and she wore her [U.S.] hockey jersey. It was cool because she took her legs off, she told us the story about how she got hurt in Korea, and she ended up choosing to have her legs taken off, she actually paid for them to be taken off because they gave her so much trouble. She had them taken off somewhere around the knee and now she has prosthetics for them,” Carter said. Following Gardner’s presentation, the yearbook staff at Richland R-1 School did some digging. “Well, my staff started doing some research on the team that she played for because we wanted to make sure we would reference them correctly. As we did, we learned that they are not fully funded by USA Hockey— USA Hockey doesn’t fully fund the U.S. Women’s Sled Hockey team… It’s because the IOC, the International Olympics Committee, doesn’t recognize women’s sled hockey, or women’s para-hockey, as they call it, as an Olympic sport. The men’s are, but the women don’t get the chance to. We didn’t think that was right; we don’t agree with that,” Carter said. Upon discovering this information, Carter and Killian decided to contact the team’s managers to ask about providing assistance of any kind to the team. “[The team doesn’t] even sell tickets; their games are free. You could just walk in off the street to watch them play. The issue that we had was that we needed to find something that we could do to help,” Carter said. Tom Koester, one of the team’s managers, mentioned the help they could use on creating a new website. Immediately, Carter realized this was something his yearbook staff could take on. “As we got to talking, I realized the dream we had for this was a little bit more than what my students could handle on their own. I said, ‘Well, how about bring in students from other schools?’” Carter said. Carter emailed eight schools throughout Missouri that he and his students believed would be of great help in executing this major feat. Of the eight, five schools’ advisors replied with great interest. After the schools gathered their resources, a lengthy and detailed planning phase ensued. “[A student was assigned to create] a document that had all the different jobs on it that we could think of that we may want. We had interviewers, we had video editors, we had a war room editor, we had still photographers, we had still photo editors, it had everything on it. We started putting students in those spots and started scheduling with the team. When can we take portraits? When can we do interviews? This went on for about a month, I guess,” Carter said. When the one big weekend in December arrived, the everyone was prepared. “On Friday at 4 o’clock, we had 34 students that got together at the Wentzville ice Arena and we had our meeting. We met for about an hour. All the students got to know each other; we laid out the plan for the weekend. From four o’clock on Friday afternoon to 7 p.m. on Sunday, these students created the website, did the interviews, shot the video, edited the video, edited the interviews, wrote profiles, shot still photos, edited still photos, created photo galleries, and built the entire website in a weekend,” Carter said. “We had students from five different high schools all working together, and I did not see the war room until Sunday. When I walked in on Sunday, you would have thought these kids had been working together for five or 10 years, and they had known each other less than 48 hours,” Carter said. Following Friday evening’s interviews, the athletes were impressed. Carter received feedback from the players that the interviews the high schoolers led were perhaps the most professional interviews they had ever had done. “As a teacher, that made me feel good. My kids were ready. They were prepared,” Carter said. Since the website was created, the team still plays, and will continue to play, a significant role in these high school students’ and advisors’ lives. “All the players have been incredible as far as support. Even when they find a mistake, they’ll send me a message and say, ‘Hey, Carter. You guys did an awesome job, we can’t thank you enough. Is there any way that you can fix the spelling error on this or if you see this, can you guys get in to fix this? Don’t worry about it, not a huge deal but just if you can.’ That is one of the coolest things— how they responded to it,” Carter said. Beyond strictly designing a website, these high school students were able to get to know the players of the sled hockey team by sharing a meal. “It was making the athletes real, it was making the athletes human because we have a tendency in sports to put athletes up on a pedestal, especially ones that we don’t see every day and we don’t have a lot to do with every day. When you go to a (St. Louis) Cardinals game, you cheer for the Cardinals, you cheer for your heroes. These (women) really are heroes. There are no other women’s teams in the country, so it’s not like they play women. They play men’s teams,” Carter said. Perhaps the most rewarding result of this project went beyond just helping this team get an updated website. “To be able to see my students sit back and how proud they are of it— they took great pride in creating this thing because we realize it’s gonna go to the IOC. The International Olympics Committee is gonna see this site and they’re gonna see the videos and this team is trying to raise money right now so they can go to the World Cup. They don’t get to play in the Olympics, so they host their own World Cup the same year as the Olympics— they’re gonna have it in May in the Czech Republic. So they’re trying to raise money for it right now and that’s one of the main ways they’re raising money is through that website,” Carter said. This opportunity proved to be one of mutual appreciation among both the players and the students, said Matthew Schott, publications adviser at Francis Howell Central. “I think that the work that you do, whether as a student journalist or a professional journalist, does have an impact,” Schott said. “It can make a change, (and) it can have an effect on people’s lives. I think a lot of times, the field of journalism is maligned and people will think bad things about it. I think this was just a really positive experience for everybody. Whether it was our students who worked on it or any of the athletes— they were really gracious and giving of their time. This was definitely something that was appreciated by all the parties involved from the athletes’ side for what we did— building the website, shooting the videos and photographs— but it was also a pretty professional news experience for all of these kids. Aaron Manfull, director of Student Media at Francis Howell North, agreed.